Havana was the second promotional single released from Camila Cabello’s debut album, Camila, and its success came unexpected to many. 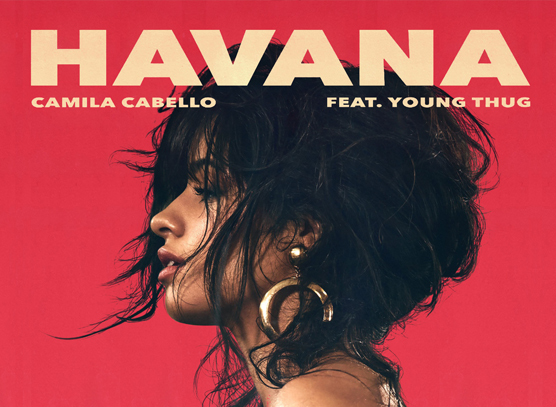 In a recent interview, Cabello told NME, “we didn’t even release Havana as a single because no one believed in it enough,” adding that people were telling her, “that’s a cool song, but it’s definitely not what you want as a single from your album.” However, Cabello’s instincts proved to be correct and the single was a huge success, making it to the top spot of over 30 charts, and solidifying her position as a major solo artist since leaving Fifth Harmony. On the surface Havana might seem like just another Pop song, but when you look under the hood you can see how meticulously well-crafted and clever it really is. Not only does it capitalize on some of today’s hottest trends, such as Hip Hop, Trap, R&B/Soul and Latin, but it also breaks from Pop song conventions, which helps it to stand out among its contemporaries. One of the key ingredients to Havana’s success is no doubt its hooks, and the clever and methodical manner they’re woven into the song. At the heart of Havana is the nonsense “na” vocal hook. 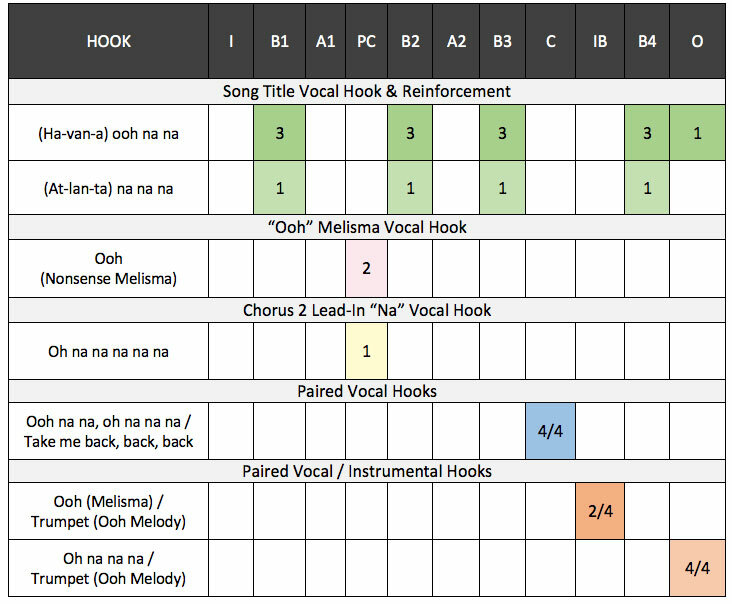 “Na” hooks have played a key role in some of popular music’s biggest hits, including Steam’s Na Na Hey Hey Kiss Him Goodbye (1969), The Beatles’ Hey Jude (1969), and Rihanna’s What’s My Name (2010). Havana, the newest member of the “na” #1 hit club, features this nonsense lyric 75 times throughout the song. In order to keep it sounding fresh and prevent it from becoming overly redundant, it’s reinforced with a variety of melodic and lyrical changeups. In the pre-chorus, “oh na na na na na” functions as an infectious lead-in to the chorus that follows. In the chorus, “ooh na na” is paired with the song title and together comprise the song-defining “Ha-van-a ooh na na” vocal hook. This hook appears three times in each chorus section and is cleverly reinforced by the “At-lan-ta na na na” vocal, which features the same melody. The bridge features two back-to-back “na” variations (“ooh na na, oh na na na”), followed by the proper vocal “take me back, back, back.” This infectious three-way hook pairing repeats throughout the bridge, providing a development in the narrative in an infectious, hook-based manner. And last, but not least, the “oh na na na” vocal from the bridge is recycled in the outro, in addition to the return of the “Ha-van-a ooh na na” song title hook, which closes out the song. But why stop at “na”? The writers, which include Camila Cabello, Ali Tamposi, Andrew Watt, Brandon Perry, Brian Lee, Frank Dukes, Jeffrey Williams, Louis Bell, Pharrell Williams, and Starrah, decided that another infectious nonsense vocal hook was warranted, enter “ooh.” This melodically vibrant hook is the focal point of the pre-chorus, and cleverly conveys the way the antagonist makes the protagonist feel without the need for words, while at the same time providing an infectious spin. Following the instrumental break, the song heads into the fourth and final chorus and then into the outro. The outro technique they use is something that we at Hit Songs Deconstructed like to call The Grand Finale Hook Fest. This is where some of the most infectious elements from multiple sections are repurposed in the outro in order to create a memorable grand finale for the listener. The bridge provides the “oh na na na” vocal hook, the instrumental break provides the trumpet hook, which again features the same melody as the infectious “ooh” vocal hook, and the chorus provides both the powerful accompaniment and the “Ha-van-a ooh na na” song title hook, which reinforce the song title one last time in an infectious manner as the song comes to a conclusion. Havana’s infectious hooks and their clever/methodical deployment are just one of the many things that helped it become such a grand success. Be sure to check out the full Havana Deconstructed Report for a deep dive into the songwriting and production techniques used to craft this song. Hit Songs Deconstructed subscribers can log in here. Not a subscriber? Click here.